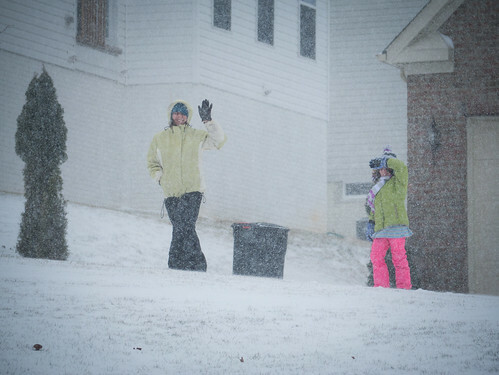 Tuesday we were hit hard by Winter Storm Janus. It was a teacher work day, so Molly already had no school. She planned to go over to a nearby friend’s house to play. Little did we know she and Jen would be walking through so much falling snow. A few hours later I walked down to walk Molly home. We decided to walk back through the back yards (that’s our porch down on the right). The snow had gotten up to 5 or 6 inches at this point. I chose to walk on the relatively flat ground, but Molly instead chose to walk along the top of the hill. 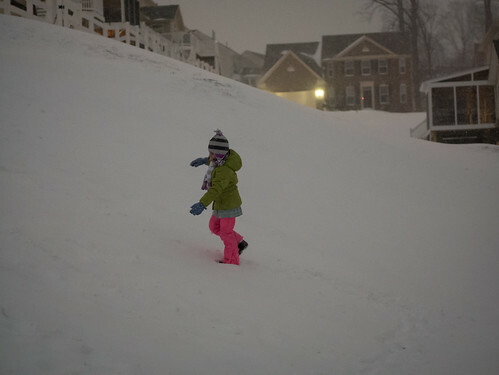 This meant that when she got to our house, she got to run down the hill through the snow. What could be more fun? The snow kept falling into the night, which meant the following day was the fourth day off school due to snow in this school year. 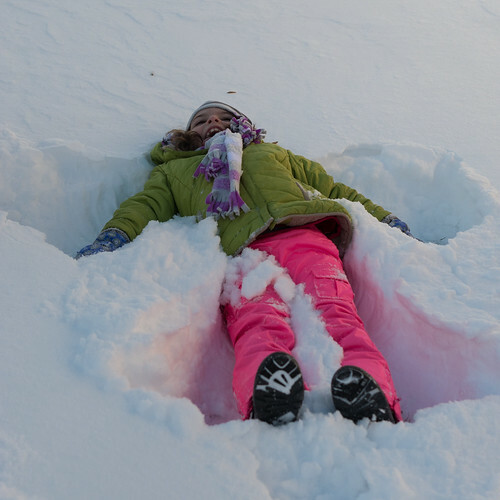 First task - make a snow angel. Looks like we got a lot of snow this time. 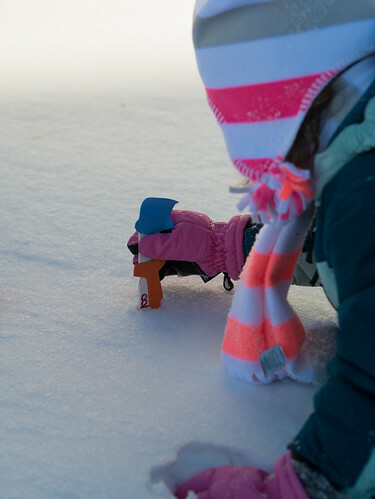 Leah made a snowman ruler at school to measure the snow. Looks like we got 8 inches, which is conveniently the maximum length this ruler can measure. 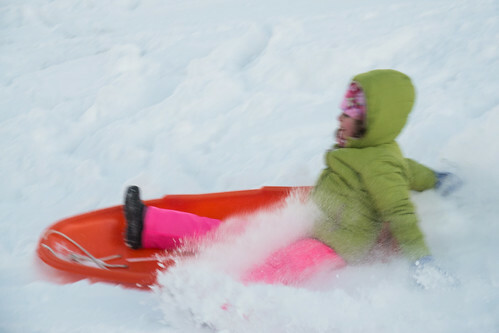 Then it was time for some sledding. 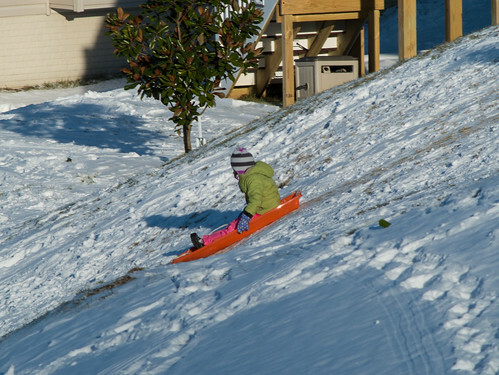 For some odd reason, Leah decided she was scared of sledding (despite having done it many times before). She did sled down twice with me, and admitted that it was really fun and only a little bit scary, but still refused to sled any more. Molly, on the other hand, was happy to sled over and over again. 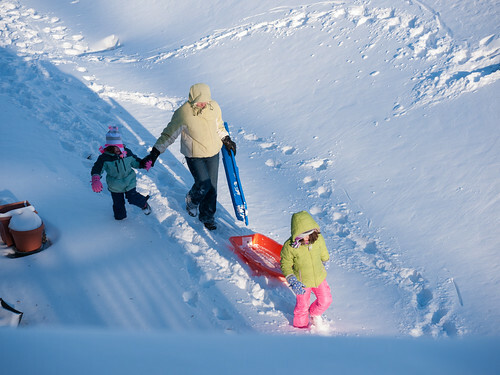 Later that day, Molly headed back out to sled with some other kids while Leah was sleeping. She was happy to find her friend Ariana to play with. There were lots of other kids there as well. This is the back yard a few houses down from us. Despite not looking very fancy, these sleds can really move. She’s moving too fast for my camera here as she starts to stop at the bottom of the hill. Unfortunately the fun had to end. Thursday sent Molly and Leah back to school (though after a 2 hour delay), which meant no more playing in the snow. The snow's not going anywhere right now, though, as it's been incredibly cold with temperatures starting the day around 5° and rarely getting above 15°. 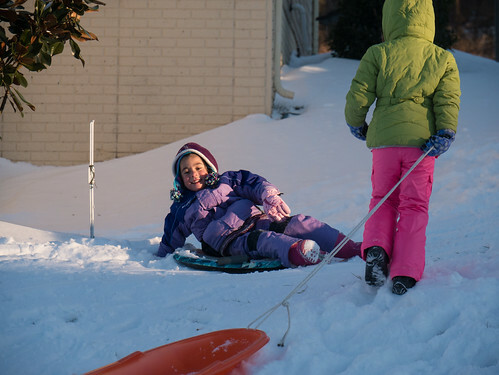 We're forecasted for a bit more snow tomorrow, so there may be more fun winter play to come. It’s much warmer today, but it’s been raining all day. I figure that means it’s a good day to stay inside, but Molly had other ideas. 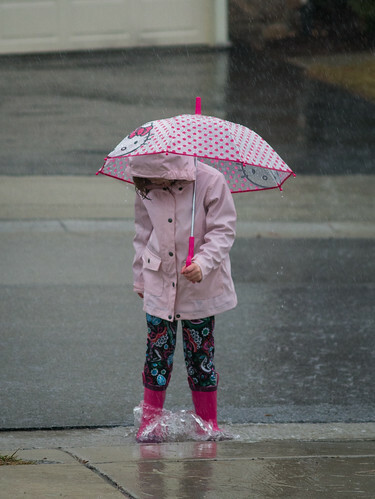 Time to play in the rain. 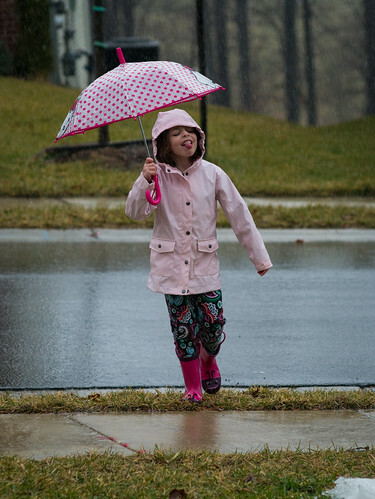 When playing in the rain, don’t forget the importance of getting a taste. 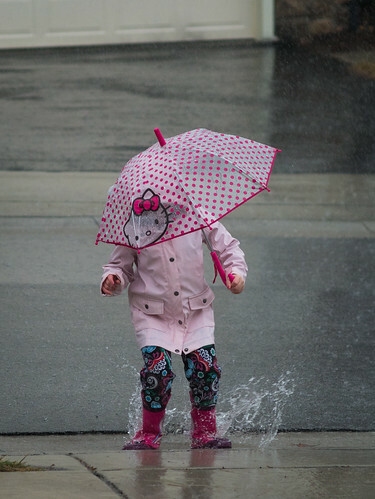 Playing in the rain wouldn’t be complete without jumping in puddles (or in this case, the stream of water running down the hill). She's ready to lift off. Nice jump, Molly. Always important to bend the knees on the landing. There wasn’t enough splash on the first jump. This is much better. When the water’s really flowing, there’s no need to jump. Just stand there and let the water rush over your feet. She stayed out for quite a while and had a great time. By the time she came back in, she was pretty soaked. 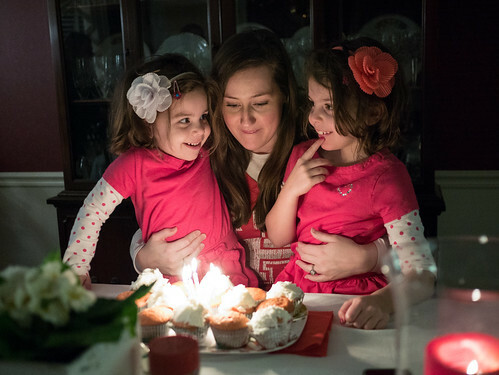 We joined together with my family at Grams’s house to celebrate Aunt EA’s birthday. As she did last year, Grams made strawberry cupcakes - some with frosting and some without (since Aunt EA is crazy enough to prefer no frosting). It’s a cutting board! How exciting! Just look at Molly’s face. OK, maybe a cutting board is more exciting for a 30-something than a 6 year old. 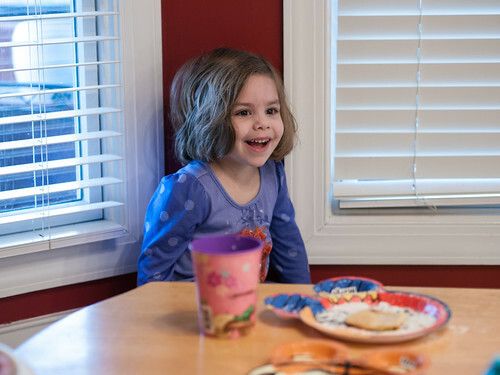 After a quiet New Year, Molly headed back to school on Thursday January 2nd for a short two day week. 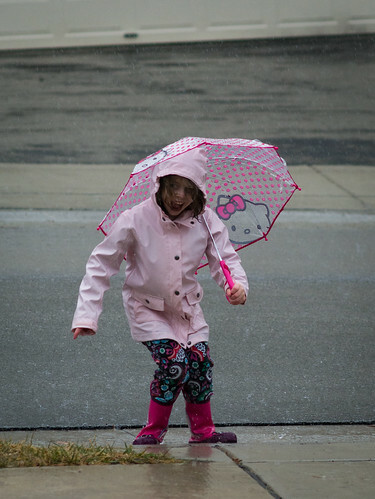 That short week was cut in half when it snowed all Thursday afternoon and night, giving her a snow day on Friday. The girls were excited to get out and play in it. 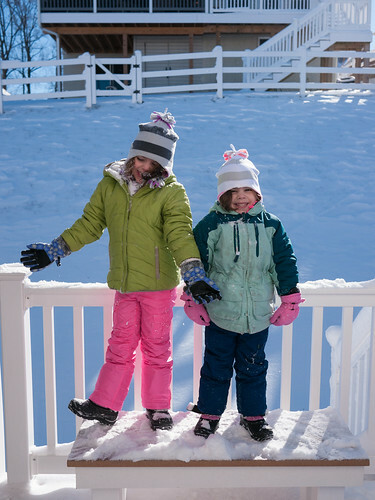 This is the first snow day since Jen got the girls some snow pants. They were very excited to be able to play in the snow and not have soaking wet pants within minutes. Here they are ready for some fun. Zane: "Are you wearing jeans?" Zane: "Why aren't you wearing snow pants?" Jen: "Because I don't have any yet." I guess Jen and I need some snow pants. 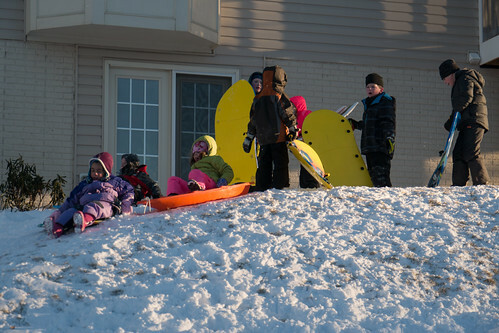 I peeked out the window a bit later to see how they were doing, and found them on their way home from a few doors down after some fun sledding and playing with other kids. 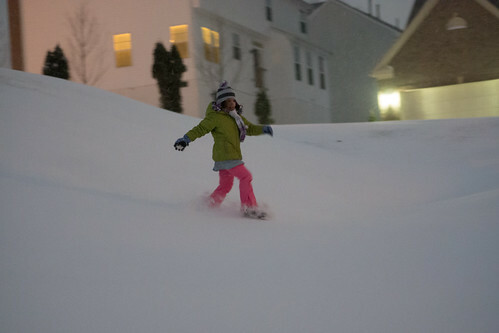 The next day, after a morning of ballet, Molly was eager to get out in the snow again. 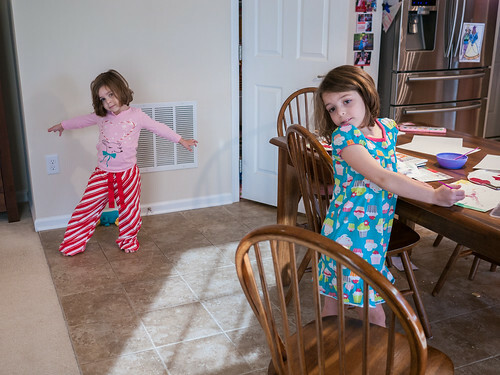 Leah went down for a nap, and Molly wandered to a friend’s house to see if she wanted to play. 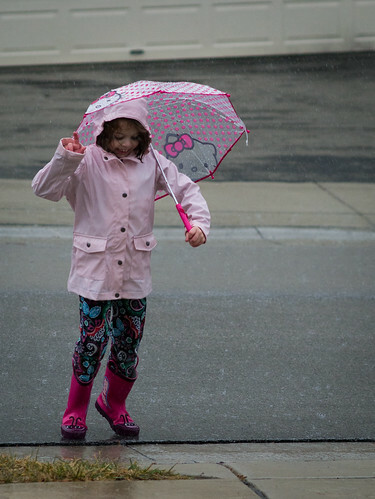 She wasn’t able to, but Molly was undeterred and joined in with some other kids a few doors down. She stayed out playing in the snow for several hours. There were a couple girls early on, but by the end it was just Molly and 5 boys. 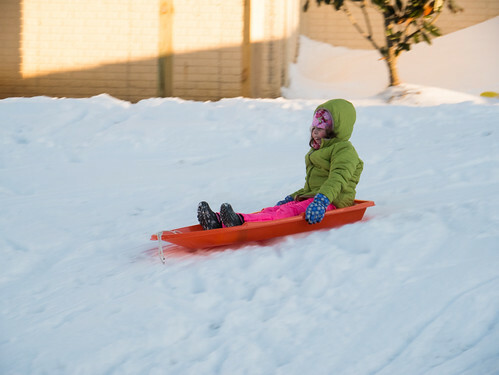 It was the first time we’ve let her sled without one of us around (though we peeked our head out the back door every few minutes). She did great, though, and kept going until she had completely turned into an icicle. Three snow days off school already. If things keep up like this, they're going to be in school until July. 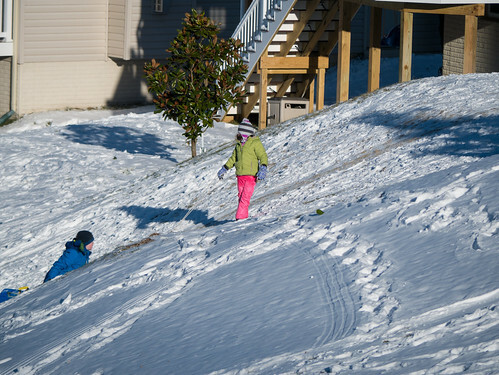 In the mean time, the girls have been making the most of all the snow in our very hilly neighborhood. Today, Molly's starting an art class after school. Molly loves art, and goes through paints, colored pencils, and crayons like they're going out of style. And Leah loves art as well. So, after returning home from Birmingham with some brand new paints, the girls were ready to get to it. After a bit, Molly decided to paint a picture of Leah. So, Leah posed as the model for Molly to paint. She did a good job posing for a long tie while Molly painted her. After Molly was done, they reversed roles. After the large family celebration, we headed back to Aunt 'Chelle and Uncle J's house. Shortly after arriving there, the power went out. 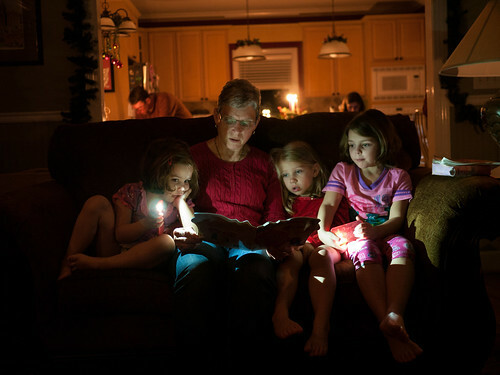 But that didn’t stop G’Mom from reading a story to her granddaughters before bed. 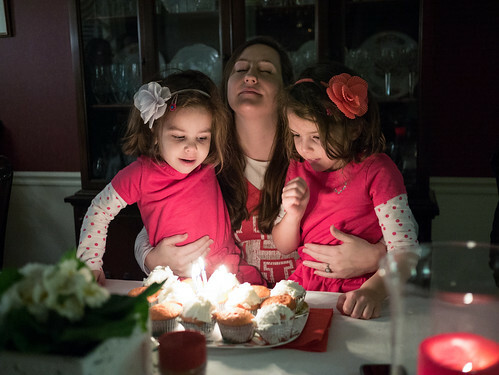 Molly and Leah were happy to provide a little light from their iPhones. 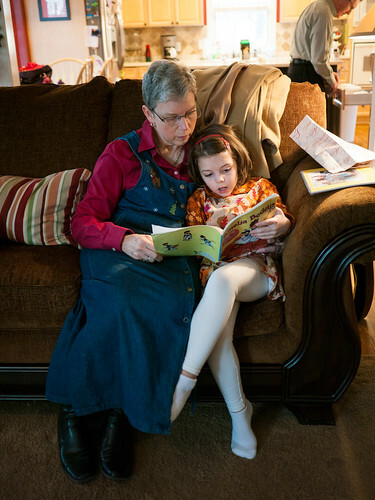 The next morning, Molly switched from listener to reader, reading to G'Mom from her new Amelia Bedelia book. 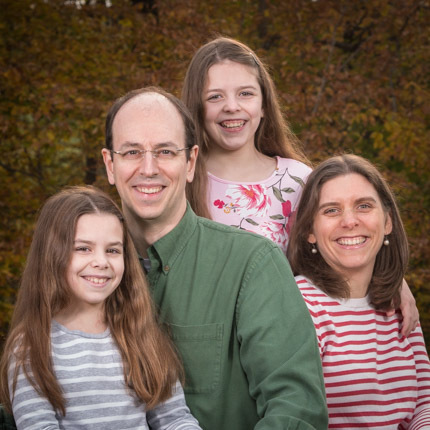 That day included church, a relaxing afternoon, and celebrating Christmas with Jen's Uncle Ted and Aunt Jeannie (sorry, no pictures). The next morning began with beignets for breakfast. Leah, I think you’ve got some powdered sugar on your nose. Either that or we need to start looking into rehab facilities. JJ loved the beignets, and ate a bunch. 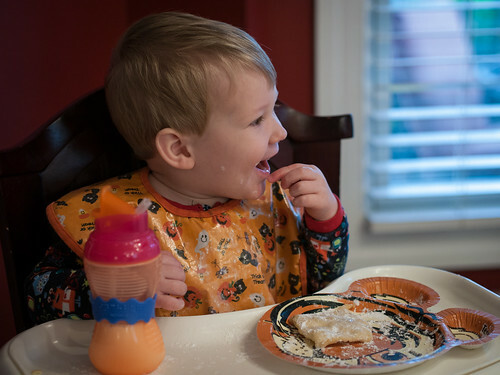 That is, until Emmie showed him how to pick up the powdered sugar with his fingers. Then he was happy to stick to the sugar and avoid the beignet itself. I call this the Juncle gym. Get it - a cross between “Uncle J” and “jungle gym”. OK, I’ll stop. 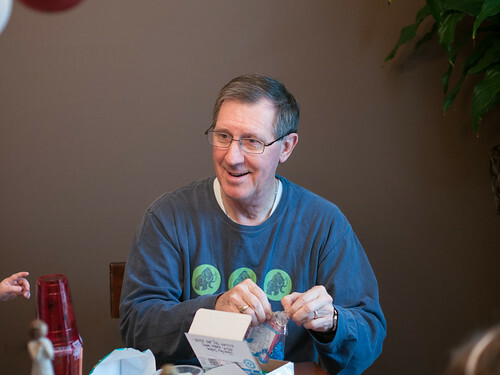 One more celebration - Grampa’s birthday (a day early). Happy birthday, Grampa. Then we headed to the airport to fly back home, thus ending the week of celebrations. They were lots of fun, but I was happy to sleep in the next morning. After a busy morning, we headed to Uncle Rick and Aunt Roxanne’s house for the extended Batson family Christmas celebration. Here’s everyone in attendance. 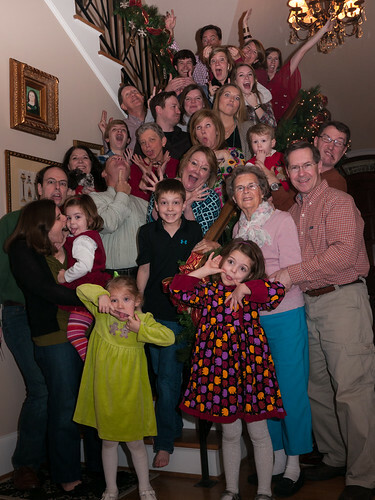 Per tradition, we had to take a silly one as well. 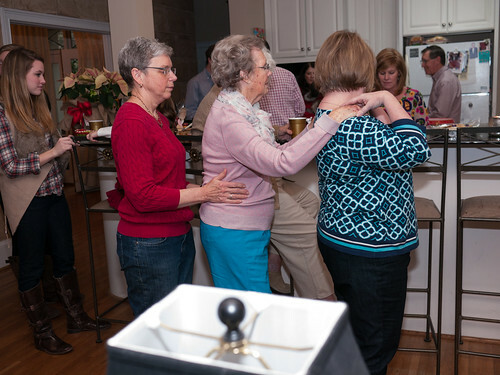 Dot decided to start a conga line. 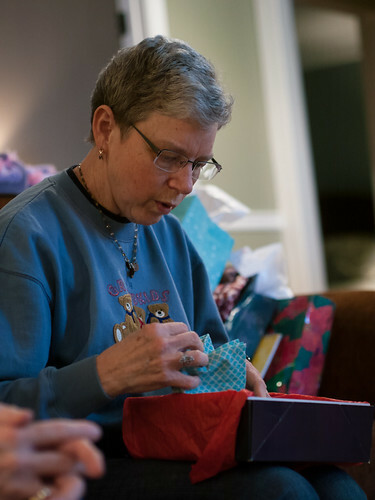 We draw names for gift exchange. 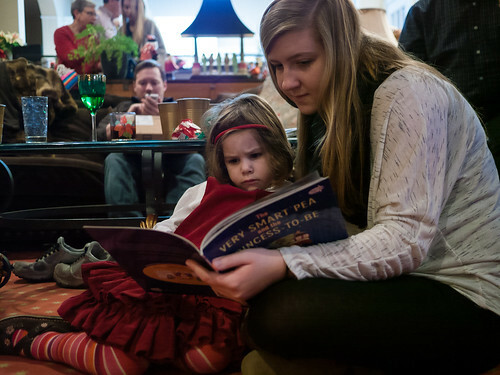 Maggie drew Leah, and her gifts included a few books. She may not have expected that Leah would require an immediate reading of them. 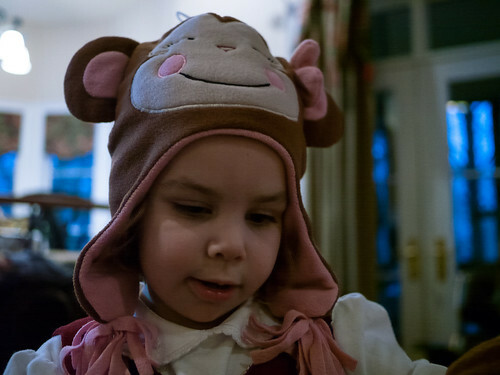 Leah also got a monkey hat with some mittens. 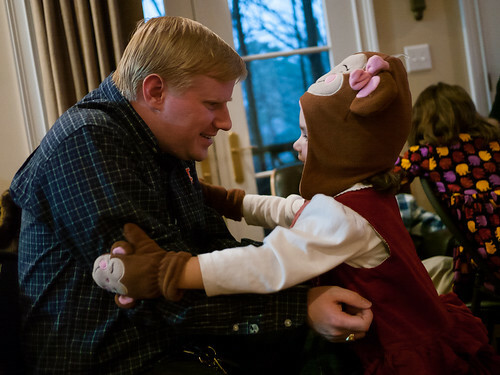 She enjoyed wearing them, but she also enjoyed trying to put them on cousin Mike. Here she is wearing her monkey hat herself. Mike also got a hug from that monkey. Update: I’ve been informed that this was not a hug at all. 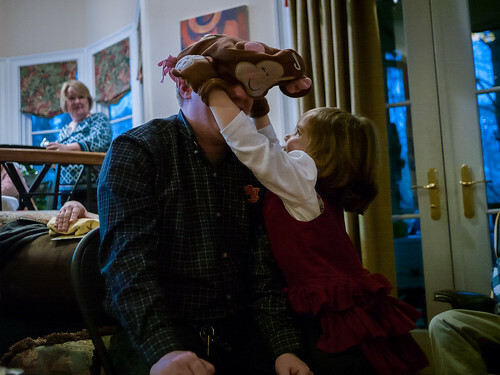 This is actually an attack, in which Leah’s monkey gloves are eating Mike’s shirt. 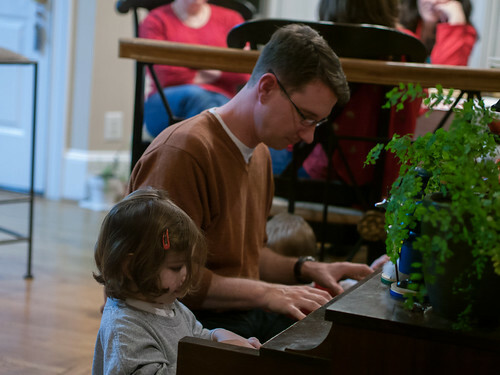 Uncle J and Leah played a duet on the piano. Leah had an accident requiring an outfit change, but we had no clothes for her to change into. 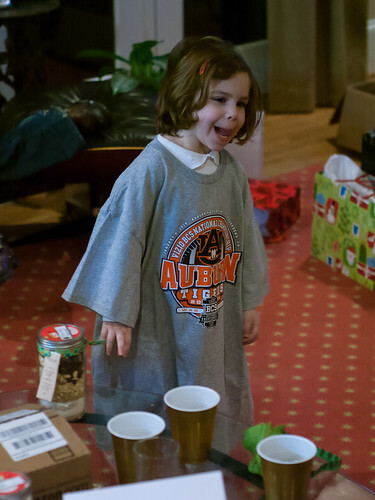 Thankfully, I'd gotten a t-shirt for one of my gifts, which made a nice dress for Leah. It was great to see everyone. Being so far away, we don't get to see them very often. Thanks so much to Rick and Roxanne for hosting. 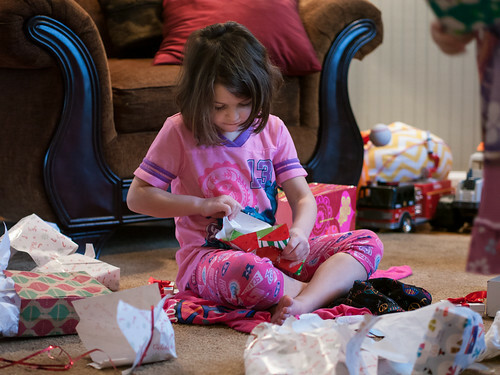 The next morning, we moved on to opening presents with Jen’s parents and their descendants. We got to it pretty quickly as the day was packed with things to do. As the youngest, JJ got to be first in the rotation. 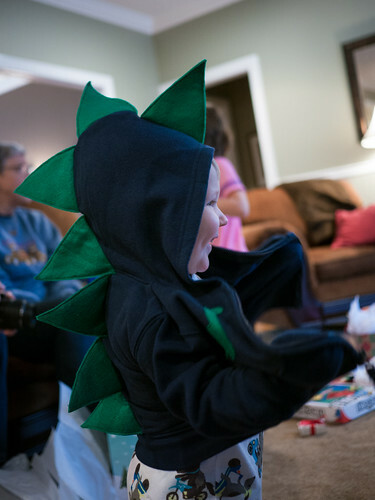 Jen made JJ a dinosaur sweatshirt. 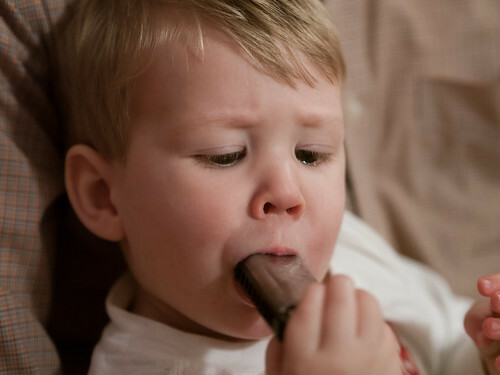 He loved it, and just kept saying “dinosaur” over and over. He also loved that it had pockets, though he needed a little help getting in and out of them. 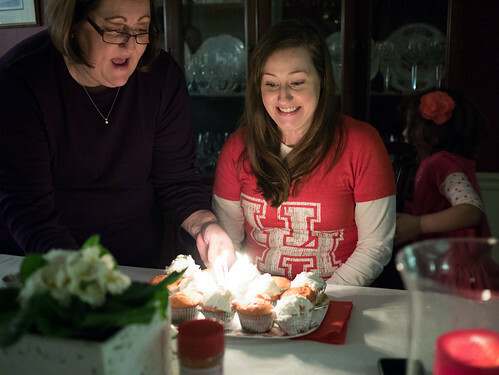 Jen made her mom some lovely napkins. 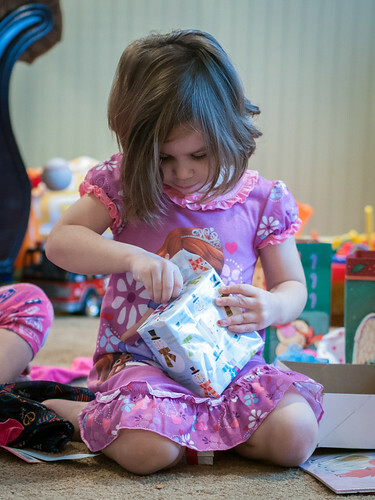 The girls love opening presents. Leah wanted to hug G'Mom and Grampa to thank them. I'm not sure about her face here. 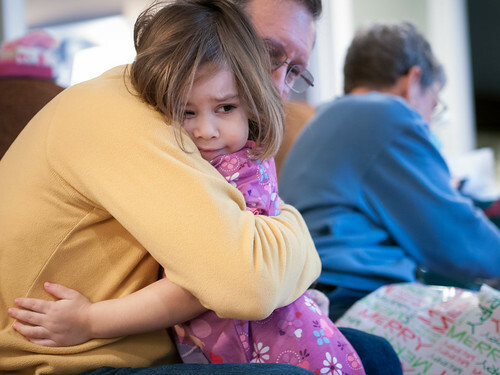 She really was happy to hug Grampa. 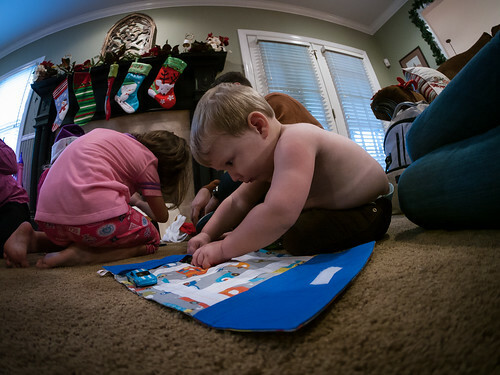 Jen also made JJ a car play mat. After taking the cars for a spin, JJ is intently putting them back in the garage. 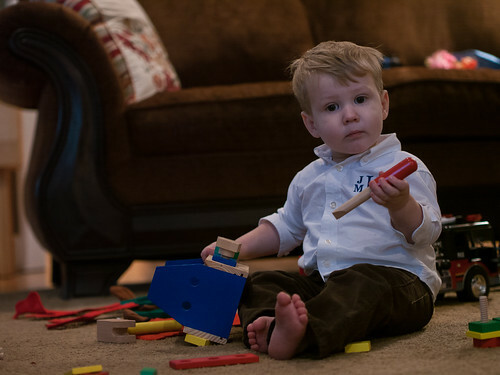 JJ loved this wooden toolbox, as did the girls. They all played with it a bunch over the course of the trip. We've been in Alabama for less than 24 hours, but it's been action packed and will continue to be. 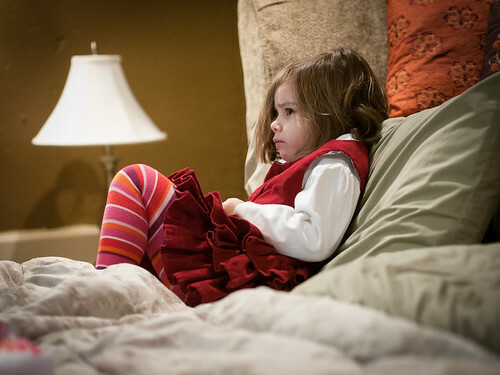 So, Leah decided to go down to the basement to watch a movie by herself for a little down time. As an introvert myself, I can relate. 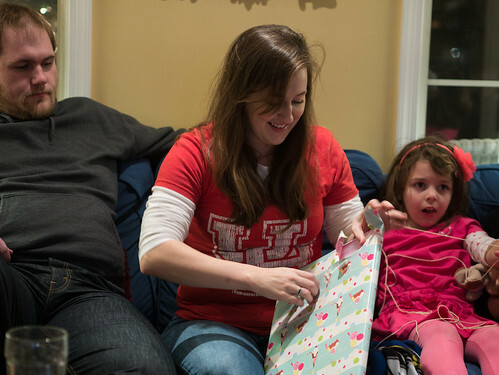 Less than 48 hours after we finished opening presents, we were on a plane headed to Alabama to keep on celebrating. The girls sat with me as always. 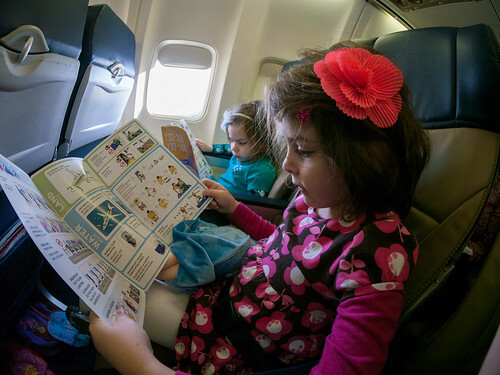 And of course, it’s important to review all the safety procedures before taking off. 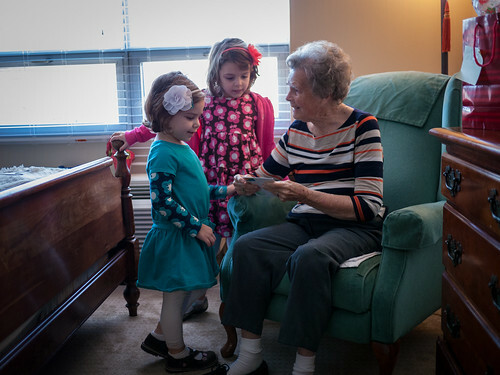 The first stop on arriving in Birmingham was to go see Great Grandma Dot. 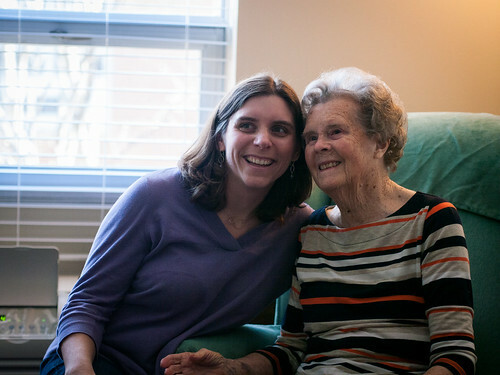 She’s recently moved into a new place in the Alzheimer's unit where she lives, so we went by to check it out. 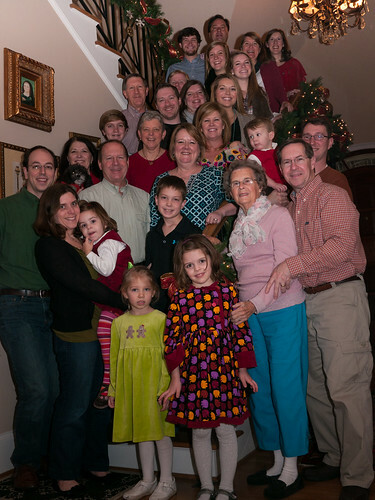 Our next stop was Aunt ‘Chelle and Uncle J’s house, where the entire Batson family gathered for an evening soiree. 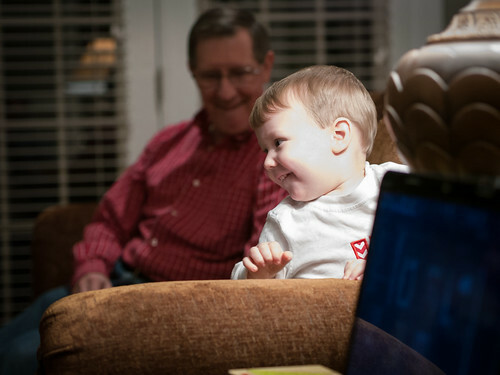 JJ loves his Grampa, especially when he’s giving him snacks. 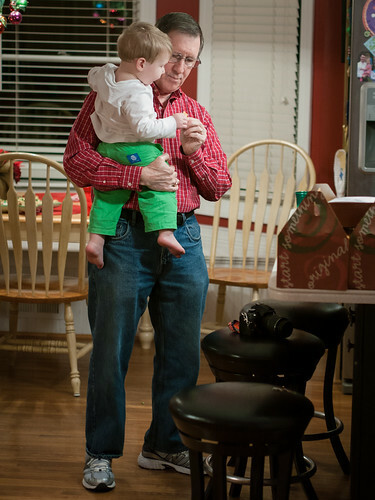 I think Grampa’s about to get this little cutie from behind. 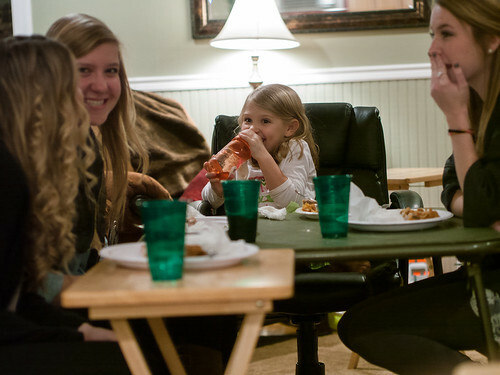 Leah loved hanging out with the single ladies, especially Maggie. 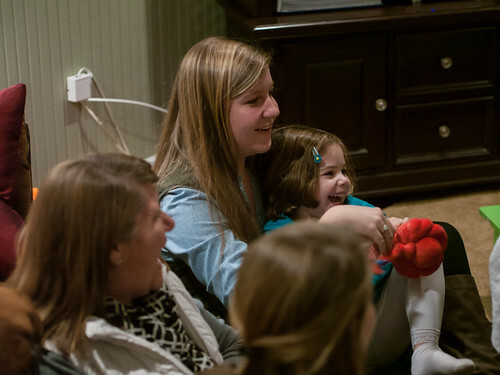 Emmie may only be four, but she kept the older girls giggling with her stories of her boyfriend. 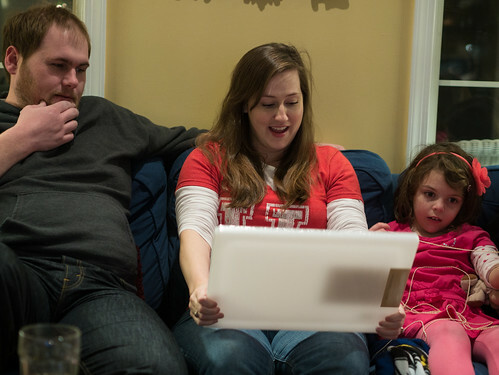 Leah captured the attention of Sadie and Mary with some interactive learning on the iPad. 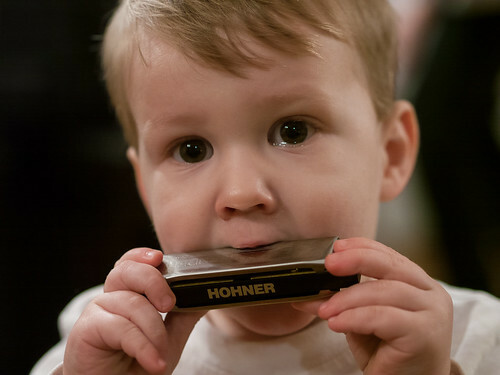 JJ’s already got a knack for the harmonica. OK, maybe he needs a little more practice before we call him an expert. That's all I've got for the first day of our trip, but there was still a lot more family and celebrating to come.